Priscilla Sam works in a company which is all about putting the pieces together: LEGO Canada Inc. And in 2015, she realized that there was an important piece missing in her professional life. Priscilla Sam got more than she bargained for when she enrolled in Rotman’s Morning MBA. Passionate about continuous development, Priscilla saw that in order to advance in her career, she would need to invest in her leadership skills and deepen her knowledge in management frameworks. Business Design was an easy choice, but she would have to fit this learning journey into her already busy life. Once Priscilla started her MBA, she got more than she bargained for, thanks in part to the strong networking component of Rotman’s program. Priscilla recently moved into a new role at LEGO Canada, integrating her employer’s sales and marketing objectives with those of the retailers, allowing the partners to build business together. She credits her MBA with broadening her perspective. Priscilla works in Trade and Retail Marketing at LEGO Canada Inc. She earned her degree in Rotman’s Morning MBA program in 2018. This entry was posted in Morning & Evening MBA, Morning MBA, Student Life and tagged Alumni, Business Design, Careers, Networking, Powerful Network, Women, Working Professionals on April 23, 2018 by Rotman ME-MBA & MFin. CFA or MFin? Why not both? If you are currently studying for your CFA exam or are a charterholder, you may wonder if you should consider completing a Master of Finance (MFin). To give you some perspective, we spoke to a number of our Rotman MFin grads who are also charterholders. “While Rotman’s Master of Finance and the CFA both cover a wide range of finance topics, the MFin explores each area in much greater detail while the CFA is more focused on portfolio management.” Tracy Chong, CFA, MFin ‘17. As Tracy points out, becoming a Chartered Financial Analyst (CFA) is key to certain positions within the financial sector, including portfolio management. However, the MFin will prepare you to go even further in your career. Having both is definitely an advantage, if you want to be a finance leader. Ashley Warburton, CFA, MFin ‘17 and Francois du Toit, CFA, MFin ‘16 both agreed that learning from practically-minded faculty was invaluable when exploring current events in financial markets. Ashley remembers, for example, learning about coco bonds in Fotini Tolias’ class and seeing them affect European banks balance sheets, which resulted in changes in their stock price this past February. Ultimately, while the CFA may give you key foundational concepts to understand these events, it is in the MFin that you’ll get the deeper insights to interpret and understand the complex set of variables that impacted turns in financial markets. Without a doubt, together the CFA and the MFin will make you a strong candidate in the financial sector. In addition, if you are currently completing the CFA Level III exam and are thinking of applying to the MFin, you have the advantage of receiving a GMAT exemption, as you can automatically be considered for a conditional offer. What are you waiting for? Put your CFA knowledge to the test, and contact us or apply now to become our next MFin candidate. This entry was posted in Master of Finance and tagged Admissions, Alumni, Careers, CFA, Current Students, Fotini Tolias, GMAT, Heather-Anne Irwin on November 12, 2017 by Rotman ME-MBA & MFin. 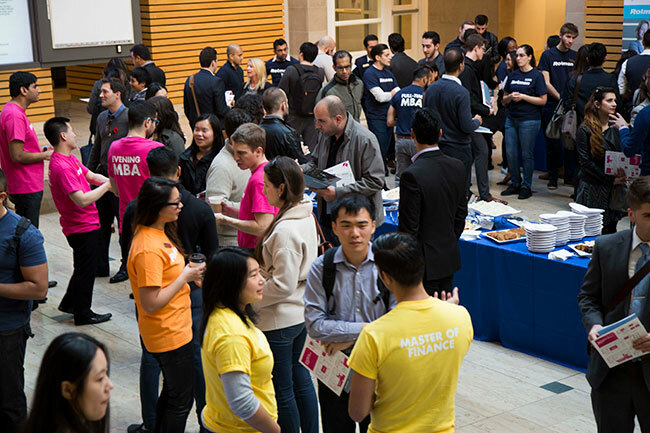 At the Rotman School of Management we want to accelerate the careers of our students. As one of the largest MBA career teams in business education we want to maximize your learning experience. The list of services available to students is extensive and varies by program, but includes one-on-one coaching, 24/7 online resources and workshops and speaker events. Our career coaching model is highly personalized. Students are paired with a career coach in their first year and remain connected throughout their time at Rotman. You will also learn how to leverage your degree within your organization. We provide career services for working professionals. Your Career Services team is dedicated to supporting all Morning and Evening MBA and Master of Finance students throughout your journey at Rotman and beyond. Our goal is to equip you with a lifelong toolkit you can use to take ownership of and manage your career and professional development. Whether you are looking to advance within your company or switch to a new industry, we are here to assist you in developing your Career Management Plan to achieve your career goals. This Plan will be based on an understanding of your interests, values and strengths, coupled with knowledge and awareness of career opportunities that you will explore and target. We provide one-on-one coaching, advice on how to position yourself in the market, targeted workshops, plus a wide variety of online tools and resources to help you achieve your career goals. Professional goals are a priority, we have a full week dedicated to career preparation. This includes over 100 hours of career workshops and skill building sessions. Our career services include individual career counselling appointments which includes a self-assessment, resume and cover letter review, networking techniques, interview preparation, behavioural mock interviews, job offer and negotiation advice, to name a few. We also provide professional development workshops about defining your career objectives, branding and positioning, crafting your network pitch, developing a job search strategy, workshops and speaker events. Finally, there are our online career resources which are job postings, career development guidelines, research tools and the alumni database. We help you refine your career goals, market yourself efficiently and learn to network. As a member of the Rotman community, you have access to a global network of prosperous alumni. We provide carer support throughout your journey at Rotman and beyond. This entry was posted in Careers, Executive MBA, Master of Finance, Morning & Evening MBA, Morning MBA, Student Life and tagged Career Services, Careers, Current Students, Master of Finance, MFin, MFin Curriculum, Morning & Evening MBA, Powerful Network, Rotman, Tips & Advice, Working Professionals on August 18, 2017 by Rotman ME-MBA & MFin. 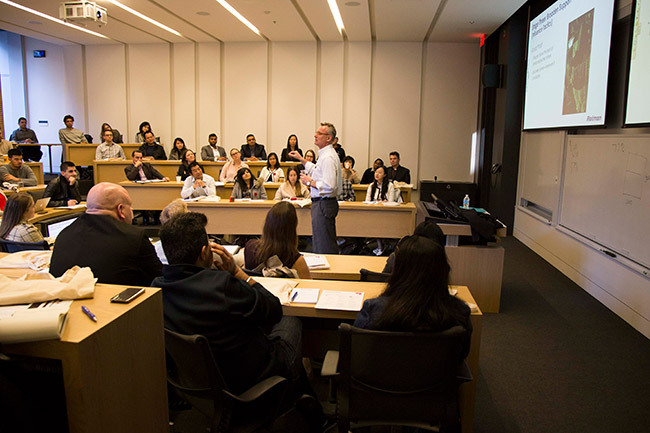 With the One Year Executive MBA (EMBA) program at the Rotman School of Management, we’re focusing on helping managers and executives discover their true leadership potential. The EMBA curriculum is dedicated to real life application and taught by a world renowned faculty who are experts in the field. Jasmine Wong, EMBA 2018 shares her experiences with the program. Jasmine is a Senior Manager, Planning in the Office of the President at Rogers Communications. Her work revolves around executing visions through key initiatives such as regional planning and delivering the strategic agenda of the organization. “I always wanted to do an MBA, so it was always about the timing. I had some of the business theory through my undergraduate degree in Commerce but I felt I needed the industry knowledge to make the most out of the MBA so that I could bring those experiences to the classroom.” The Executive MBA Class of 2017 had on average 15 years of work experience and nine years in a management position. To learn more about the One-Year Executive MBA Program, visit our website. This entry was posted in Executive MBA and tagged Admissions, Career Services, Careers, Current Students, Events, Faculty, In their own words, Networking, Part-Time MBA, Tips & Advice, Working Professionals on May 22, 2017 by Eva. Pursuing a Master’s degree is a large decision to make and starting a family is an even bigger one. Imagine trying to both now; that is to undertake a Master’s degree program while continue to working and raising a family. It’s tough, but it’s not impossible. At the Rotman School of Management, we make a continued commitment to all our students in supporting their professional development but also personal growth. We spoke to Jinzi Zheng, MBA 2017 on how to balance her time between raising a family, pursuing an MBA and working at the same time. Prior to joining Rotman, she obtained her Bachelor of Applied Science in Biomedical Engineering and also has a PhD in medical biophysics and is currently a scientist at UHN and assistant professor of Biomedical Engineering. She is also the Co-Founder of Nanovista Inc., a startup dedicated to developing new technology that can help with patient care. After completing her MBA, Jinzi hopes to use the knowledge she has gained from the program to continue to run her successful company as well as leveraging her network to grow professionally. “Through this program, the people that I have met and the connections I’ve made have definitely changed my career. It’s great to be part of the Rotman family. The entire experience has been amazing for me. To learn more about our programs for working professionals, visit our website. This entry was posted in Master of Finance, Morning & Evening MBA, Student Life and tagged Admissions, Careers, Current Students, In their own words, Part-Time MBA, Tips & Advice, Working Professionals on May 15, 2017 by Eva. Introducing Our Executive MBA and Global Executive MBA Programs! The Rotman School of Management offers degree programs for working professionals at all stages of their career. For senior management professionals looking to take their careers to the next level, we’re pleased to introduce our One-Year Executive MBA and Global Executive MBA programs to this blog. You’ll get an inside look into these two programs and read about current students and alumni as they take you through their transformative journey at Canada’s top business school. The One Year Executive MBA is more than just a degree, it’s a hands-on leadership experience that will change the way you think and lead. Over 13 months, a combination of an innovative curriculum, world renowned faculty, and participation in our Leadership Develop Program will give senior decision-makers the tools to reach their true leadership potential. Taught through in-person classes on Fridays and Saturdays twice a month and four one-week residential modules, the program is structured to minimize time spent away from work while maximizing learning. Visit the One Year Executive MBA website to learn more. The Global Executive MBA is an 18-month program for working professionals that takes you on a journey to key business hubs on 5 continents around the world. This program allows students to grow their leadership on the global stage. In between residential modules, students work on assigned readings, and team-based and individual projects. As globalization continues to dissolve business boundaries, obtaining an internationally recognized degree from one of the world’s most prestigious universities sets you up to make an immediate impact in your career and organization. Visit the Global Executive MBA, website to learn more. We’re excited to be bringing you content from these two programs in the near future. This entry was posted in Executive MBA, Global Executive MBA and tagged Admissions, Career Services, Careers, Executive, Executive MBA, Faculty, Global Executive MBA, Global Experience, management, Networking, Open House, Part-Time MBA, Recruitment, Sample Class, Working Professionals on April 4, 2017 by Eva. In today’s rapidly changing world, new innovations and technology are at the forefront of economic growth. Having recognized this early on, the Rotman School of Management at the University of Toronto has become a leader in developing the next generation of entrepreneurs with the Innovation and Entrepreneurship Major as well as the Creative Destruction Lab. Since its launch in 2012, startup ventures from the Creative Destruction Lab (CDL) program have generated over $1 Billion in equity value. We spoke with Yen On, Morning MBA 2016 who currently is the Course Manager at the Creative Destruction Lab. She shares more about what the CDL program is and how MBA students can get involved with the Lab. The Creative Destruction Lab is made up of three parties who work tightly together over the course of 9 months. First there are the G7/ML7 Fellows who are phenomenal and successful entrepreneurs that advise companies who go through the CDL program. Examples of advisors are Ted Livingston, founder of Kik and Tony Lacavera, founder of Wind Mobile. Second are early stage technology companies looking to scale their idea into a high growth company. Finally, there are a group of talented MBA students who join through the CDL course where they work with one of these startups during the year. For more information about the Part Time MBA program, visit our website. This entry was posted in Beyond the Classroom, Morning & Evening MBA, Morning MBA and tagged Careers, CDL, Creative Destruction Lab, Entrepreneurship, In their own words, Part-Time MBA, Powerful Network, Working Professionals on March 28, 2017 by Eva. Hello Tony! Thank you for sharing your experience as a student and alumnus with us. It hasn’t been that long since you graduated, how did it feel in your second year as an alumnus not to have to go back to school? To be honest, it felt weird! I was really busy while I was in school and I got used to it. Having to go to work and school at the same time, I had developed a routine to help me keep up with the work and also maintain an active social life. But, now that I am done, I feel as if I’m slacking. So much so that I decided to join recreational classes and activities such as cooking, badminton, volleyball and Frisbee. What does it mean to you and your career to be an alumnus of the MFin program? It’s hard to say at this point because it’s only been a year since I graduated, but I can say that I’m still connected with friends from the MFin program. It feels good to know that I’m still part of the Rotman community and that I have met so many people with common interest and life experiences, who are now some of my best friends. Did the program give you a new appreciation for a different area(s) of finance? Yes, the curriculum covered a lot of important basis and some foundational concepts that weren’t as familiar to me. This also sparked new interests. For example, before joining the MFin program I didn’t know a whole lot about investment banking and wasn’t sure if I would find it interesting. However, once I joined the program and took the investment banking course I learned to really enjoy the subject. I was surprise that I was interested in this content, but after taking the course everything in finance makes more sense to me. How did the program expand your professional network? One of the major benefits of joining the MFin program was the possibility of expanding my network. As a graduate, today, I can definitively say it helped me make more connections. Think about it: because you are studying alongside finance experts and working professionals in some of the major financial institutions in Canada, you have a chance to make extremely good connections. In today’s labour market there is a lot of emphasis on networking, and many people choose to attend conferences and events to meet people in their field. This is good, but it is definitely a lot better when you are able to get to know these people over two years of course work. After all, if you are part of the same team project, they’ll get to know how you really work and be able to vouch for you. How have the relationships you’ve made during your program impact your year since the graduation? I made some great friends during my time as an MFin student. I think this is mainly because we share so much in common. Before joining the program, I only had a small group of friends with whom I could actually discuss politics, finance and our careers. Thanks to my time at Rotman, I now have a really close group of friends with whom I can engage in these kinds of conversations. My friends from the program are also good people to go to for professional advice, and I think that is invaluable. Have you been able to make a career switch or receive a promotion because of the MFin? I did change careers during the program. What I can say with certainty is that graduating from the MFin program definitely made me a more confident professional. Ultimately, I think this will positively impact my career going forward. Do you have any words of advice for future students or anyone thinking of applying now? I think everyone considering applying to a Master’s program should think of their own criteria for doing so. We all come with different experience and career goals and it is important to stay true to yourself. I would also urge applicants to do their research! They should speak with faculty members, the recruitment team and current students to really understand what the program is like and how it can benefit their careers. Ready to learn more about the MFin program? Visit our website or sign up to one of our admissions event and start preparing to become a finance leader. This entry was posted in Master of Finance and tagged Admissions, Alumni, Careers, CFA, In their own words, John Hull, MFin Curriculum, Networking, Rotman Finance Lab, Tips & Advice, Working Professionals on February 21, 2017 by Eva. You can find Canada’s only Morning MBA program at the Rotman School of Management, University of Toronto. Here, ambitious working professionals learn from a world class MBA from 7-8:59AM twice a week before work. We recently had the opportunity to speak with Ain Ansari, Morning MBA Class of 2018 who gave us an inside look into the classroom of a Morning MBA student. He shares his insight into courses, work life balance and the integrated thinking method at Rotman. As part of the program schedule, students partake in 3 different intensive weeks. This is where students take part in a course that is condensed into a one week timeframe. During an intensive week, students take the entire week off work and are fully dedicated to school and immersed in their studies. The schedule is packed, typically running from 9AM- 4PM. As Ain describes, “Intensive courses are case-based, it’s not as much lecture and textbook readings, but instead based on case and in class discussions.” Students are taught concepts through lecture based-learning and then apply them in a case-based scenario. The week is fast paced and requires students to be on top of all readings and to be prepared to actively participate in class. Morning MBA Students celebrate after the Winter 2018 Intensive Week is Over! Ain took RSM2607: Managerial Negotiations with Professor Glen Whyte for his first intensive week. He described it as “an extremely practical course. We had a different case every day that we would discuss and act out in role-play.” For example, one situation had students divided into 6 different parties where they had to negotiate the best deal. Strategies that were taught included union, B2B, employer and government – business negotiations. During a school semester, students take two courses, one on Tuesday and one on Thursday, both from 7AM – 8:59AM. During the first half of the program, students take the core courses required in the curriculum. Throughout the remainder of the program, students can pick from over 90 elective courses from 16 different majors to fully customize their MBA experience based on their interest and career goals. During another intensive week, Ain took RSM1301: Fundamentals of Strategic Management with Professor Will Mitchell. He discovered that when developing a strategy, there is a lot of quantitative reasoning involved. There were a lot of examples in Canada as well as emerging markets that highlighted relevant cases. The course forces students to think critically and ask questions that a normal investor would not ask. To learn more about the Morning & Evening MBA program, visit our website. This entry was posted in Morning & Evening MBA, Morning MBA and tagged Careers, Current Students, Curriculum, Electives, Glen Whyte, In their own words, Intensive Week, MBA Majors, Part-Time MBA, Powerful Network, Theory in Practice, Walid Hejazi, Will Mitchell, Working Professionals on February 15, 2017 by Eva. The Master of Finance (MFin) at the Rotman School of Management develops leaders who are also key team players at work. Elizabeth Ren, CPA, CA, MFin ’17 is a great example. Recently, we interviewed Celina Li, Hedge Fund Accountant at SS & C Technologies and Elizabeth’s colleague, who emphasized the benefits of working alongside an MFin student. Hello Celina! Thank you for chatting with us. We are excited to hear your thoughts on what it’s like to work with a Master of Finance student. Could you tell us a little bit about your work with Elizabeth? Thank you for reaching out, I am happy to tell you about my work with Elizabeth. We currently work under the same director, but for different funds. Essentially, we have the same position, but we work with different clients. However, we work in a team environment, so we have opportunities to collaborate with each other on such things as financial reporting. We also engage in discussions during our monthly team meetings. Do you find that your discussions at work are different with Elizabeth? The technical knowledge she shares with us during meetings and when working on team projects helps solve issues that benefit the whole team, not just her clients. For example, she is currently in charge of setting up a new fund and, as a colleague, I get to learn from her experience and the creative solutions she brings to develop this fund. Ultimately, it is a learning opportunity for the whole team. What would you say are important skills that she’s been able to learn and integrate in her work since she became an MFin student? She’s been able to learn how to prioritize and manage her time to reach a high performance level at work as well as in school. In fact, she always comes to work early to avoid missing any deadlines while she is completing coursework. Do you find that teamwork is different since Elizabeth joined the program? Elizabeth is a very effective and collaborative team player. I think this comes from having to work on group projects during her MFin program. Recently she was tasked with training two new colleagues; she’s doing a stellar job at mentoring them and explaining the ins and outs of our work. Has her experience in the MFin program impacted your own work in any way? Definitely. As she creates the new fund for her client, I get to learn the strategies she implements to arrive at a solution. It is also inspiring to see her become a leader as she trains and mentors new colleagues. Are you an aspiring leader at work? Join us at one of our admissions events or contact us to learn more about the Master of Finance at the Rotman School of Management. This entry was posted in Careers, Master of Finance and tagged Careers, Current Students, MFin 360, Women, Working Professionals on February 8, 2017 by Rotman ME-MBA & MFin. At the Rotman School of Management, the Morning & Evening MBA is not just another business degree. It is also an opportunity for you to strengthen your critical thinking skills in a business environment—essential as you move up in your career. In this week’s interview, two of our students’ employers share their thoughts about the Rotman MBA program and what they think has been one of the most valuable skills their employees have gained: critical thinking. Dennis McCatty, Director of Sales at Hewlett Packard Enterprise and Run Yu’s (MBA ’18) employer, believes that Run’s existing professional capabilities can take her far in her MBA career. Since joining the program, he noticed a substantial improvement in the way Run approaches problems in the workplace. When Run was thinking about joining the Rotman MBA program she approached a number of people in the organization, including myself. Because I already thought that she was a great professional with a lot of potential, my first reaction was to say that she didn’t really need an MBA. After all, many executives have gone a long way without the degree. However, once Run explained that she wanted to join the program and the Rotman community to confront new challenges and gain new perspectives in the business field, I was on board with the idea. As a learning experience, the MBA program can reveal new frontiers, pushing you to think in a different way and from different business angles. I think the MBA program at Rotman is helping expand Bojan’s vision and is strengthening his thinking process. Since he started the program, Bojan has begun to look at the broader context of the business and not just the technology we work with at Toronto Hydro. As an Electrical Engineer, one could fall into a tendency of focusing too much on the technical aspects of the job, and not enough on other variables that may be affecting our work and our overall business. However, through the MBA program, Bojan has had exposure to different industries and fields, ensuring he analyzes problems critically and within their broader context. These employers also agree that the ability to think critically in their jobs has not only been evident through the way they tackle business issues, but also in the creative and innovative practices that these students have come up with in their projects at work. With Run, I’ve noticed a willingness to truly understand the nuts and bolts of our products and our issues in order to proactively create solutions and add value to the team. She doesn’t only focus on the ‘what’ of our business, but digs deeper to understand the ‘why’. For example, in her work for the Business Development team, if she notices a decline in sales, she looks into all the variables to understand what the real issue is that causes this decline. When analyzing how our business and projects are moving forward, Bojan has tapped into the knowledge he has gained at Rotman as well as the networks he has formed. In fact, we have recently started working on a project concerning Asset Management and Bojan has been instrumental in finding the right people to help us with this project. He has even connected with faculty members who have extensive experience in this field. Overall, it is clear that the challenging content and stimulating environment provided by the MBA program at the Rotman School of Management gives an edge to the overall graduate business experience. Through their participation in the program, both Run and Bojan have been able to gain the skills and knowledge to power important solutions and changes in their work. Can you see yourself in their shoes? Contact us today or sign up to attend one of our admissions events to learn more about the Morning & Evening MBA program at the Rotman School of Management. This entry was posted in Beyond the Classroom, Careers, Morning & Evening MBA, Morning MBA and tagged Careers, Current Students, Employer, In their own words, MBA 360, Part-Time MBA, Powerful Network, Working Professionals on January 31, 2017 by Rotman ME-MBA & MFin. In a competitive job market, it takes serious focus, drive and leadership skills to take your career to the next level. Our dedicated Career Services help our Working Professional students structure their career plan, and position candidates to reach their goals. Rotman School of Management students are equipped with a toolkit to use and to take ownership of and manage their career management plan beyond their time at Rotman. We asked Annette Filler, Lead, Career Services for Working Professionals for her Five top tips to accelerate your career. Set specific career goals and gain focus. What industry or function do you aspire to progress within? What would success look like? Do your homework on the roles that interest you, and that you aspire to. Research the market, companies of interest, and job requirements. Be prepared to start building your Career Management Plan on Day 1 at Rotman – not when you pick up your graduation gown! Be ready to invest time. It takes time and energy to switch or progress careers. You’ll have put in the hours to learn about your new function, or sector. Network and target your pitch, resume and LinkedIn profile to appeal to recruiters and hiring managers. Be accountable for your progress and eventual success. Use resources available to you, including Career Services at Rotman. Be sure to meet with your Career Coach. This entry was posted in Careers, Master of Finance, Morning & Evening MBA and tagged Career Services, Careers, Job Search, Tips & Advice, Working Professionals on January 18, 2017 by Eva. As a part-time program for working professionals, the Master of Finance (MFin) at the Rotman School of Management is designed to help students reach their full potential while at work. This means that we want our students not only to prepare for their future careers, but also to gain the confidence and practical skills to support their current teams as finance leaders. Putting our program to the test, we’ve interviewed Patricia Castanheiro, Vice President & Senior FX Trader at the The Bank of Tokyo-Mitsubishi to tell us a little bit about what it’s like to work with Sabrina Wu, MFin’17, who works as a trader in Patricia’s team. Thank you for taking the time to share your insights. Could you tell us a little bit about Sabrina’s current role and relationship to you at work? Sabrina has been working with me at the Bank of Tokyo Mitsubishi UFJ since 2013. She is currently a Money Market Trader and works on the trading floor reporting to me and another colleague. We have a mentor-mentee relationship and I’ve seen her grow tremendously since she started working with me. What did you think when Sabrina informed you that she would be completing the MFin program while working fulltime in your company? As part of our strategy to keep our talent motivated, we try to get our young professionals on the trading floor to work on each desk and expand their knowledge that way. We have a total of 8 traders and, as I mentioned before, Sabrina is currently on the Money Market side. Knowing that I am a big promoter of professional development, when deciding whether it was a good idea to start the MFin program, Sabrina came to me for advice and to find out if it would be possible to get funding from our organization. Right away, I told her she had my full support and lobbied to get our company on board as well. Have you noticed any immediate impacts the program has had on Sabrina’s work? What would you say has been the added value so far? I’ve definitely seen her analytical and research skills improve since she started the MFin. For example, we get our traders to write a weekly report providing their opinion on what’s happening in the market and Sabrina has been in charge of putting together the Money Market Weekly Report for quite some time now. I’ll be honest, when she first started it was not amazing; but 6 months down the line she got 100 times better! I’m certain it’s because of the program. She’s certainly gained greater depth in her way of analyzing changes and variables in the market. Now, you can really tell that she observes and evaluates all the information she gathers through a critical lens in her classes at Rotman. Would you say Sabrina’s experience as an MFin student has impacted the team when working collaboratively? Sabrina has always been very collaborative; in fact, I would say that she’s extremely team oriented. Thanks to her participation in the MFin program, she expanded her network outside of the bank itself. We often share our thoughts on this matter, as she’ll bring her questions to me in order to decide strategically how to best expand her network. When comparing the MFin program to other programs such as the MBA, do you think that the specialized content of the MFin program has been noticeable in Sabrina’s work? Considering the industry we’re in, the MFin is much more relevant to our work than other graduate programs in business. I have hired other young professionals that have completed an MBA or the CFA, and Sabrina’s MFin advantage is clear because she is able to apply what she learns directly into her job every day. For example, when she is working on a case study at Rotman, she is learning to respond to events that are happening in the market right now; so, it’s much more useful for us. Have you noticed any knowledge or skill become a differentiating factor or competitive advantage for Sabrina since she started the MFin program? Even though she was already well-spoken before joining the program, I still believe her communication skills have improved substantially. She also gained leadership skills and greater confidence from participating in group discussions and projects at school, which is incredibly valuable for her current job and future career. The best thing is that this is not only evident at work, it also shows in her activities outside of the office. In fact, recently, she was selected to become one of the youngest board members of the YWCA! She is certainly becoming a well-rounded leader, which I can see having a great impact on her career. How do you think this program will impact her career going forward? She has a world of opportunities and, where she goes next, is up to her! At our bank, we have internal programs where you can move for a year to another country if there is an opening. Someone like Sabrina can take advantage of this opportunity and work in offices in places like NYC or Hong Kong. For now, she is working on finishing up her program at Rotman, but it’s safe to say that the MFin has opened many doors for her. I’m excited to see what the future has in store for her! Looking for a graduate program that will charge your impact on your finance career? Visit our website or sign up to one of our admissions events and learn more about the Master of Finance program. This entry was posted in Beyond the Classroom, Careers, Master of Finance and tagged Careers, Current Students, MFin 360, MFin Curriculum, Money Market, Networking, Powerful Network, Professional Development, Tips & Advice, Women, Working Professionals on January 17, 2017 by Eva. With snow covered streets and festive lights everywhere, it can only mean one thing: the holidays are around the corner! As another year comes to a close at the Rotman School, we can celebrate this year’s achievements and look forward to milestones in the new year. We’re excited to be celebrating the 10th anniversary of the Master of Finance program in 2017. As well, we’ve admitted our first students to the Morning & Evening MBA for the class of 2020. Read about our students’ experiences at Rotman: Our Working Professionals Blog gives you an exclusive insight into how our students are leveraging their Rotman degrees in their daily lives. Apply! : Are you ready to take the next step in your career? Apply to Rotman today! Our offices are closed from December 21, 2016 to January 2, 2017. We look forward to seeing you in 2017. From all of us at Rotman’s Specialized Programs Recruitment and Admissions team, we wish you all happy holidays! This entry was posted in Careers, Executive MBA, Global Executive MBA, Master of Finance, Morning & Evening MBA, Morning MBA, Uncategorized and tagged Admissions, Application Deadlines, Careers, Current Students, Part-Time MBA, Powerful Network, Working Professionals on December 19, 2016 by Eva. 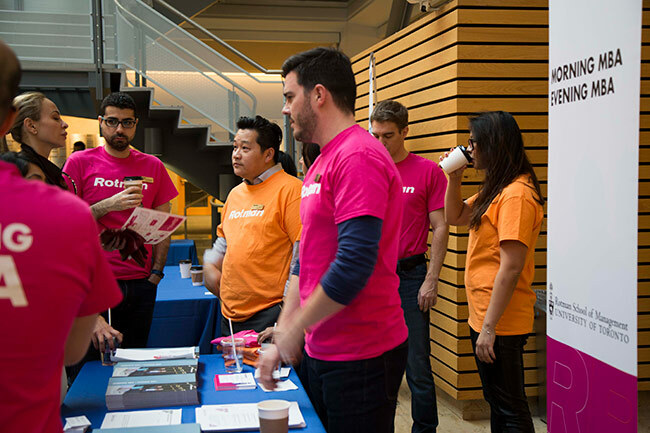 With over 300 prospective students at the Rotman Open House on Sunday November 6, the event was nothing short of a great success. The event was an exciting opportunity for attendees to learn more about the 6 programs that Rotman has to offer through engaging sample classes and information sessions. Morning and Evening MBA students are more than happy to answer questions from prospective applicants! The programs that were represented at the fair were the Morning and Evening MBA, Full Time MBA, Executive MBA, Global Executive MBA, Master of Finance, and the Master of Financial Risk Management. 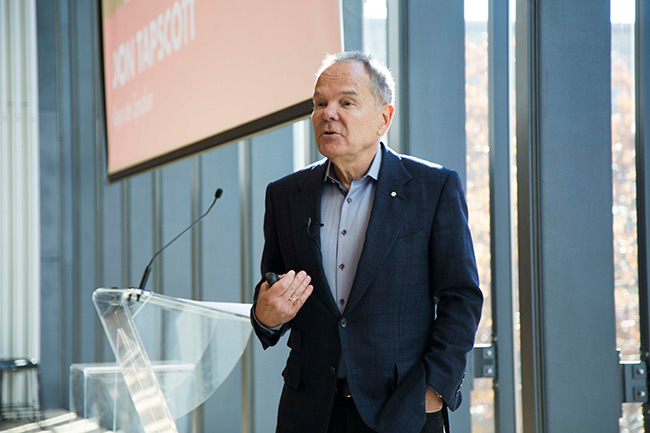 Rotman’s Annual Open House formally kicked off with a keynote speech by Don Tapscott, CEO of The Tapscott Group, and one of the world’s leading authorities on the impact of technology on business and society. He also happens to be an Adjunct Professor here at the Rotman School of Management, and was ranked the 4th most influential management thinker in the world by Thinkers50. He provided us with his thrilling insight into how blockchain is becoming an industry disruptor. Don concluded by challenging our audience, the future leaders in management, on how we can develop solutions to new technological, social and economic problems. Attendees mixed and matched the sessions that were of most interest to them. With a wide selection of 17 different sessions to attend, it was definitely not an easy choice to make. Each session brought a unique perspective and experience for our prospective applicants. On top of the information sessions led by our recruiters about what applicants needed to get in and to succeed at Rotman, there were also unique interactive sessions. In our BMO Financial Group Finance Research and Trading Lab, prospective students had the opportunity to get involved in an exciting trading simulation where they made decisions under different scenarios. There were also a number of sample classes showcasing the world renowned faculty that teach at Rotman and their research strengths. Professor Brian Golden’s sample class on Strategic Management was energizing, overflowing and was even followed enthusiastically by an international audience via our live stream! The Rotman Open House is not only a great event for prospective applicants to learn more information about the admissions process and to get their questions answered, it is also a chance to meet with our recruitment team to network and build a one-on-one relationship. On behalf of the entire recruitment and admissions team, thank you to each and every individual who took the time to come out and learn about all the graduate programs that Rotman has to offer. We hope you had as much fun as we did! This entry was posted in Careers, Executive MBA, Global Executive MBA, Master of Finance, Morning & Evening MBA, Morning MBA and tagged Admissions, Alumni, Career Services, Careers, Current Students, Events, Innovation, Job Search, MFin Curriculum, Networking, Open House, Part-Time MBA, Rotman Finance Lab, Tips & Advice, Working Professionals on November 17, 2016 by Eva. We are delighted to introduce Emily Mancuso, our new Rotman Master of Finance Assistant Director of Recruitment and Admissions! Thinking about how to accelerate your finance career? Emily will be able to answer your questions and help you find the right fit at Rotman. Please feel free to contact her directly with any questions about the Rotman Master of Finance program. This entry was posted in Careers, Master of Finance and tagged Admissions, Application Deadlines, Careers, Entrance Awards, Financing, Tips & Advice, Working Professionals on November 16, 2016 by Eva. Where are they now? Where have their careers taken them since their days at Rotman? In our new series, Where are they now?, we seek out Rotman Master of Finance alumni and ask them to review their careers since graduation. In this first blog post, Michael Hayes, MFin ’14, CFA, Director of Structuring and Credit Risk, BMO Corporate Finance took the time to share his wide ranging insights as an MFin alumni. So, it’s been two years! How does it feel? It feels great! I feel grounded in my career in finance since completing the Master of Finance (MFin); the program has a lot to do with my current success. Why did you choose to do the MFin instead of an MBA? I’ve always been a big believer that credentials are ever more important in mature industries like banking. As I wanted to remain in this sector, I knew that I needed highly qualified credentials to my name in order to advance significantly and remove any potential future career barriers. I already had a Bachelors of Commerce and my CFA, but knew that it wouldn’t be enough. When you realize that, you need to ask yourself: why am I going back to school? Is it to further develop skills necessary in my current field or to move industries and land a job in a different area? If your answer is like mine, and you are looking to become an expert in your field, then your best bet is to stay in your job and complete the MFin. With my work experience and previous education, for me, it simply didn’t make sense to do an MBA. I was more interested in the technical skills and depth of finance knowledge that could best be obtained through the MFin. What would you say have been the immediate impacts of being part of the MFin community? When I first joined the MFin program, I was managing a book of commercial clients in Toronto as a Relationship Manager. I needed a change and starting the MFin program gave me the confidence to reach out to executive leaders and to talk about my career goals. This was a great decision, as just two months after joining the program I was promoted with an opportunity to work as an Associate in Investment & Corporate Banking in Chicago, USA. Since then, I’ve advanced another two times within the same institution, with my most recent promotion in June 2016 when I became the Director of Structuring and Credit Risk for BMO’s Corporate Finance Division. I can certainly say that joining the Master of Finance was a catalyst for my first upward move. What does it mean to you and your career to be an MFin alumni? I am exceptionally proud not only of being a Rotman alumnus, but also of being a graduate of the MFin program. I take a lot of pride in being part of the highly-skilled and experienced community that is made up of MFin alumni. The Rotman MFin is a challenging program that admits students with work experience in finance. Many of my classmates already possessed designations such as the CFA or CPA. What we learn and the networks that we build are extremely valuable to our professional and even our personal life. How has this network impacted your life? I have worked with some of my classmates at BMO, and there’ve been times when we leaned on each other for career advice. More importantly, some of my best friends today are from the MFin program. You’ have to realize that in the program you not only meet people who share your passion for finance; you also meet people who share similar life experiences, whether it means being a working professional and part-time student, or having kids for the first time. In fact, aside from the intellectual stimulation present in the program, getting together with my classmates during our lunch break or after class is probably what I miss the most from the program. How do you foresee getting involved with the MFin community as an alumni going forward? I think it’s very important to stay connected. Every single graduate of the MFin program can give back and increase your scope. For example, working in a bank for quite sometime, I hadn’t been exposed to the perspectives of finance leaders who are non-bankers. During the MFin program, I met several classmates working in insurance companies and pension funds, which made me recognize the bigger world outside of banking. As alumni, we have a responsibility to pay it forward and connect with current students looking to learn about our work and opportunities in our field. What advice would you give to someone considering starting the program now? First, recognize the importance of your community of classmates who will be your connections for life. Make connections with as many people as you can. As a tip, the easiest way to do that is to never sit in the same seat twice. Second, remember that going back to school is a family decision. As a working professional and part-time student you’ll be sacrificing some of the time you spend with your family. Recognize their importance, and ensure they are on board with your plans. Third, challenge the status quo. As a graduate student, you are here to learn and push the boundaries, so don’t just settle for what’s in the textbook. The best classes take place when students challenge the concepts reviewed in class and put them to the test. Interested to learn more about what our students and alumni have to say about the program? Our upcoming Open House on November 6 is the perfect time to speak with students and alumni. Or, sign up for an upcoming admissions events. This entry was posted in Careers, Master of Finance and tagged Alumni, Career Advice, Career Services, Careers, CFA, CPA, In their own words, Open House, Powerful Network, Where are they now?, Working Professionals on November 1, 2016 by Eva. The Fall 2017 Master’s programs application cycle is now open! Start your application for one of Rotman’s Master’s programs for working professionals today! Study while you accelerate your career. At the Rotman School of Management, University of Toronto, we have four flexible options for ambitious working professionals looking to boost their potential through part-time Master’s programs. Whether you are thinking of making changes at work or expanding your professional network, now is the time to take charge of your career. Applications are now open for all our Master’s programs for working professionals at Rotman. Take a look at each of our four Master’s programs for working professionals and get ready to apply to the program that is the right fit for you. • work in the financial industry? • have solid technical skills? • want to become an expert in the finance field? Consider the Master of Finance. Attend one of our admissions events to learn more about the program or start your application today. The first application deadline is November 15, 2016. Check out the profiles of some of our students and alumni. Our Morning & Evening MBA program is perfect for those who have started their careers and want to broaden their leadership skills to strengthen their presence in the boardroom. Learn more about the program requirements through our admission events and start planning your submission for our first application deadline on November 20, 2016. At Rotman, we designed the One-Year Executive MBA program with senior industry leaders in mind. As an executive leader, this program will give you the tools to lead your team into success with confidence. Come to one of our information sessions to learn more or start preparing your application; the first submission deadline is on November 16, 2016. 18 months. 4 continents. Career Transformation. In today’s global market it is imperative for leaders to understand the complexities of doing business across border. With Rotman’s Global Executive MBA program you’ll gain the practical skills and international experience to respond to the demands of today’s globalized world. The first application deadline is on November 16, 2016. Visit our website or attend one of our information sessions to learn more about the program. Excited about the possibility of joining the Rotman community in 2017 but still unsure which program is right for you? Come to Rotman’s Open House on November 6 where you’ll be able to meet with alumni, current students and recruiters for all of our programs. This is your chance to start building connections and learning all that there is to know to ensure you prepare a great application and start your part-time Master’s program in Fall 2017. Don’t wait, register now! Bonus tip: the earlier you apply, the greater your chance of securing an entrance award. This entry was posted in Executive MBA, Global Executive MBA, Master of Finance, Morning & Evening MBA and tagged Admissions, Alumni, Application Deadlines, Careers, Current Students, Events, Open House, Part-Time MBA, Tips & Advice, Working Professionals on October 3, 2016 by Eva.